Robert Alexander Redmond was born on April 6, 1869 in Northern Ireland, the son of Samuel Redmond, farmer of Slievenaboley in County Down and Catherine (Piddock). In 1896 aged 27, he entered divinity studies at Assembly’s College, Belfast, the theological college for the Presbyterian Church in Northern Ireland. In his final year he was awarded the blue ribbon of the college: the Magill Bursary for pulpit eloquence. He graduated BA in 1898, and received his licence to preach in 1901. Rev Redmond was ordained on November 6, 1900 in First Broughshane congregation, one of the largest country congregations in Ulster, where he spent the next two years. During this time he applied himself to his work with such diligence that his health began to suffer and he applied for leave to travel to Australia to rest and recuperate. It appears from his marriage certificate, that he may have first gone to Scotland where he married his wife Sarah Wilson. Rev Redmond travelled initially to New Zealand but came to NSW in 1904 with his wife Sarah (Wilson) and daughter Molly, and was appointed by the Home Mission Committee of the Presbyterian Church to minister to the Parish of Leura - Wentworth Falls. In 1905 he was inducted into the combined Presbyterian Churches of Leura and Wentworth Falls; and as a sign of his growing community involvement, was also listed as a founding member of the Katoomba & Leura Tourist Association when their inaugural guidebook was issued in the same year. ﻿﻿Widely regarded for his oratory; the power, the wit and the eloquence of the Irish rector could move an audience to laughter and tears, and they would come again and again to listen spellbound as he preached. Eloquence that was also believed to have contributed to the success of the record fundraising effort of ₤200 for extensions to the original 1898 sandstone church in Leura. In fact such was the popularity of his sermons that even after the Leura church was enlarged to twice its original size, it was often unable to accommodate the overflow congregation that flocked to his services to listen spellbound to his words. A congregation that included many Sydney residents with holiday homes in the Mountains, as well as those staying in guest houses, for whom a stirring Redmond sermon was among the highlights of their stay. Rev Redmond was actively involved in the establishment of a golf club in Leura and was one of the first directors of the original company. When that company went out of business he set about raising capital for a new company. 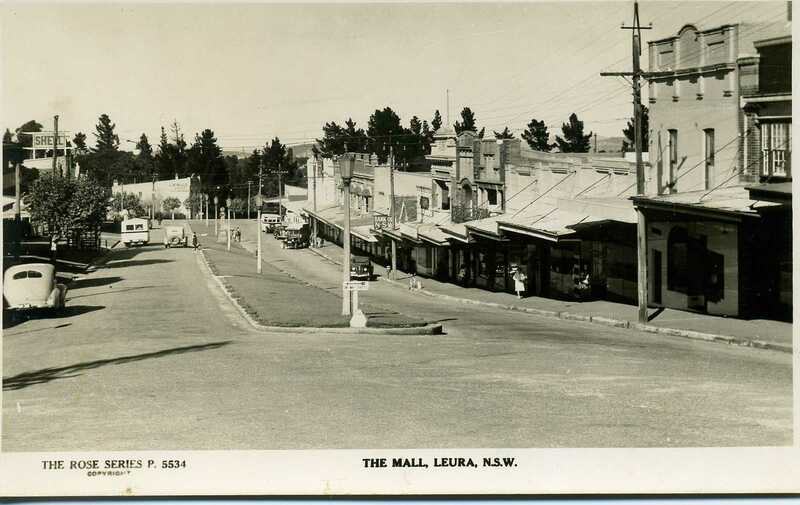 In an unpublished history of the Leura Golf Club, it states that 'Rev R A Redmond canvassed Sydney businessmen as well as local residents and his untiring efforts resulted in the amount of three thousand four hundred pounds being raised'. At the first general meeting of the Golf Links Estate held in 1909 he was elected a director, although he resigned the position later that same year. However the health concerns that had prompted his trip to Australia again surfaced and in September 1911 he underwent surgery for stomach cancer, from which he never recovered and died quietly on November 11, 1911, aged 42. The official cause of death is listed as carcinoma of the stomach and exhaustion over a period of seven months. His wife and daughter were away visiting Ireland at the time of his death and there is no record of their returning to Australia. The church in Leura was created in agreement with the Methodists and Congregationalists, who agreed to ‘confine their activities to Katoomba’. 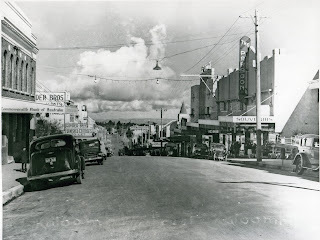 Although this rather artificial division worked amicably for a decade, eventually the increase of population compelled them to look after their own people in Katoomba. On 9 January 1911 a meeting in Katoomba declared that ‘the Presbyterian residents in Katoomba deem that the time has come for the establishment of a Presbyterian church’ and a committee of four was set up, consisting of the local minister, the Rev. R.A. Redmond, the prominent Katoomba doctor, Alexander Allan, J. Nimmo and L. Duff. Later in 1911 vacant land on the corner of Waratah and Lurline Streets was purchased and the local people decided to proceed to build ‘a substantial and ornate church’. Redmond had died in the course of 1911 and the building was to be called the Redmond Memorial Church. By the death of Rev. R. A. Redmond - news of which was received in town on Saturday - Leura loses one of her foremost citizens, and the Presbyterian Church a most eloquent and able preacher. The deceased gentleman had been associated in all movements for the advancement of the district, and his demise at so early an age will cause a vacancy difficult indeed to fill. A large number of representative townsfolk paid their last tribute to his memory on Monday when the funeral took place at Wentworth Falls. A well-worded reference to his untimely death was made by the Rev. W. Ellis at the Anglican Church on Sunday last. The hymn, “'Now the Laborer's Task is O'er”, was rendered by the choir, and at the evening service, Mr Inman played The Dead March in Saul. Dead! And there's many a man could have been better spared, was the general verdict when the news flashed through from the city hospital that Rev. Redmond, the popular Presbyterian Pastor of Leura, had paid life's penalty - the victim of a malignant growth, which, for the past year, had caused him trouble. His death was not unexpected. It was well-known that the good man was booked for his last long journey, but nevertheless, a deep gloom settled over both centres when it was known that his spirit had fled. Rev. Redmond was a man of strong personality. He was a cultured and convincing preacher, and worked wonders for his Church in both Leura and Wentworth Falls. Blessed with a heart as big as a house, he had a large fund of sympathy for human frailties, and his good deeds, performed in every instance with almost apologetic secrecy, will live for ever with Leuraites. He was a happy combination of human and divine, and was beloved by all denominations on the Mountains. About a month ago he went to Sydney to undergo an operation. Although the surgeon's skill was successful, the sufferer never rallied, and on Saturday morning he was summoned to meet his Masses, for Whom he had laboured so loyally in this Vale. The funeral cortege started from Messrs Woods' Funeral Parlour, Sydney, at 7.45 am on Monday, and was entrained at 8.27 am for Wentworth Falls, several ministers and other friends accompanying it. At various stations en route, many of the deceased minister's co-Presbyters joined the train. On arrival at Wentworth Fails, a large number of people from his late charge and district were sorrowfully waiting. The Right Reverend, the Moderator of the State General Assembly (R. Kay, M.A.,), who had travelled from Germanton, joined with the Rev. James McKee, Moderator of deceased's Presbytery, headed the procession. These were followed by the members of the Presbytery, the Rev. Steel, M.A., J. Paterson, A. Dandie, W. R. Milne, H. Wilson, R. B. Garner and the Rev. Prof. Clouston and Rev. J. J. Gilmore. The Church at Wentworth Falls was overfilled with a sorrowful congregation. The suitable music was kindly arranged for by Rev. Mr Robison, C.E. Minister, whose organist officiated. Within the Church, where the coffin, covered with beautiful wreaths, rested, the Rev. J. McKee presided, prayers were offered by the Right Rev., the Moderator and Rev. J. Paterson, and the lesson was read by Rev. R. Steel. Upon leaving for the cemetery, the Ministers formed a double line, between which the coffin was borne to the hearse, and the procession, largest and most solemn ever seen at Wentworth Falls, wended its way to the last resting place of mortality. Here reverently the Rev J. McKee committed the body to the ground, which loving thought had beautifully carpeted and lined with ferns and white flowers. The resurrection lessons were read by the Rev. J. J Gilmore, and prayer was offered by Rev. H. Wilson. The Rev. Professor Clouston pronounced an eulogy on the beloved Minister, whose mortal remains were now consigned to the tomb. He referred to his success as a student and as a pastor of one of the largest and most important Churches in Ulster before threatening sickness urged him to come to Sunny New South Wales. He testified, as they all knew, to his success at Leura and Wentworth Falls, the Church at each place being a monument to his earnestness. Though dead, he would still speak to them, for the memory of one so singularly gifted and of such happy nature would remain green. Before the benediction was pronounced by Rev. W. R. Milne, it was announced that the Rev. J. J. Gilmore, a long-time friend of the late Mr Redmond, would conduct memorial services at Leura and Wentworth Falls on Sunday, 19th November. Mr W. Wood, Financial Secretary, and Rev. R. Steel made the arrangements for the funeral. There are actually four local memorials to Rev Redmond: a wing in the Leura Fairways retirement village on land formerly held by Leura Golf Club was named the Robert Alexander Redmond Wing, a plaque on the wall of St Andrew’s Church at Wentworth Falls, a stained glass window in the former Presbyterian church in Katoomba, and the obelisk in Leura Mall. 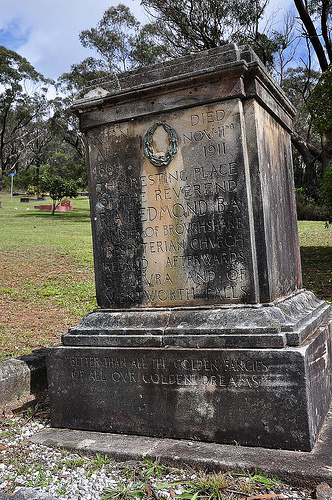 There is also a larger reminder of Rev Redmond in the form of the Katoomba Presbyterian Church on the corner of Waratah and Lurline Streets, which was built on land purchased with funds of ₤500 he had raised for the purpose before his death. The church cost ₤2,000 to build and was opened on 25 January 1914. Subsequently a Church Hall was built for ₤600 and a manse purchased for ₤2,500. The Redmond obelisk was designed by E P Andreas of Leuralla "in the form of an obelisk in freestone, upon a blue stone base, bearing upon the apex two bracket lamps". A committee of ladies, including Mrs Andreas, was asked to choose a suitable site, probably in the Mall. 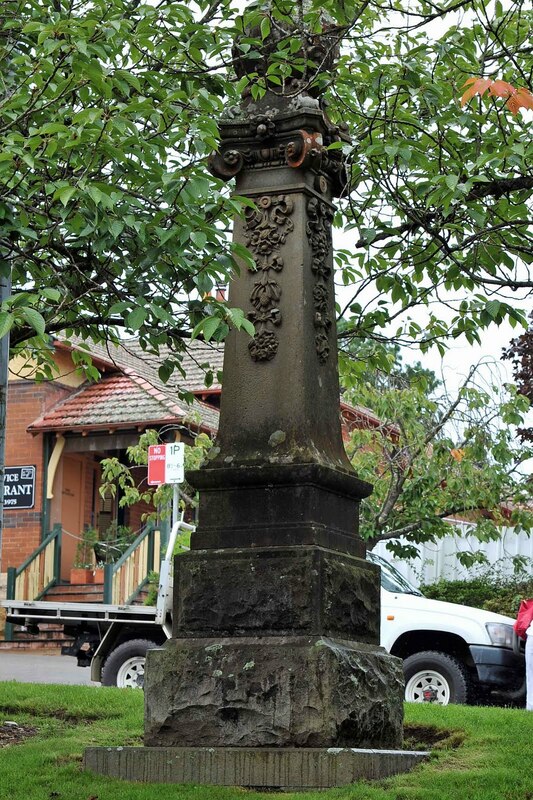 The obelisk was originally located at the intersection of the Mall with Megalong Street and held two small, rather dim, copper lamps on brackets. The Echo newspaper complained as early as 1913 that "from a utilitarian point of view, it is very nearly a failure, the old lamp post adjacent disseminating more light to the acre than the monument does to the square inch". As a result, in 1914, the twin lamps were replaced with a "single modern lamp of high candle power". The lamps appear to have been removed at the time it was relocated to its present location on the median strip around 1930. It now stands opposite the old Post Office building in Leura Mall, on a grassy bank among the flowering cherry trees in Spring; where picnickers and tourists relax, enjoying the sunshine. Few if any noticing the now weathered, ornate stone column, dedicated to the young, fervent Irish preacher once so beloved by his flock. * Ye Are God’s Building, a centenary history of St Andrew’s Presbyterian Church, Wentworth Falls NSW, 1905-2005, by Eve Sinclair, 2006. * "Presbyterian Church." The Mountaineer (Katoomba, NSW : 1894 - 1908) 11 December 1903: 4. Web. 14 Apr 2016 . Prof L S Kirkpatrick, Union Theological College, Belfast, correspondence 2009. 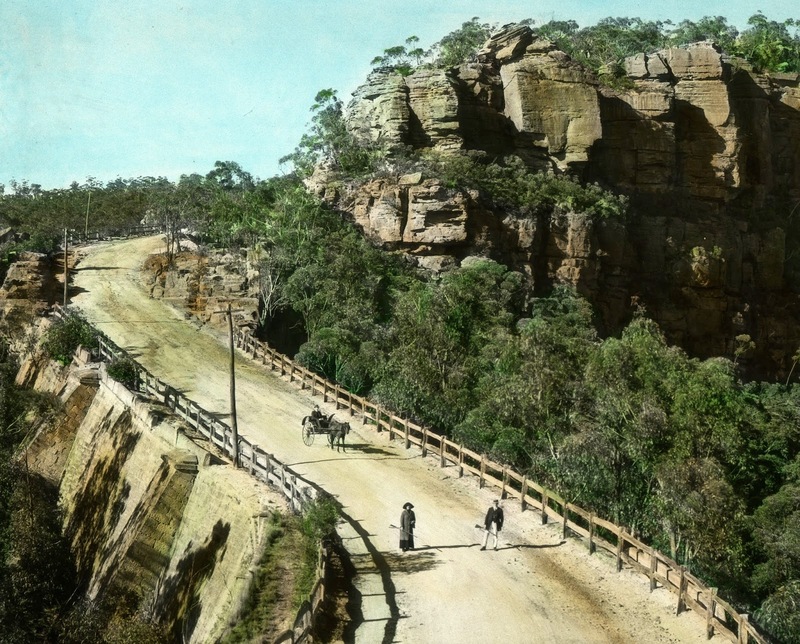 In its early years Katoomba laid no claim to the status it later achieved among the Mountain towns. While there had been an inn and stock resting place at Pulpit Hill from the 1830s, the town’s real beginnings were with the railway. Towards the end of the 1870s, this lonely mountain outpost began to change dramatically. The official name change to Katoomba occurred in 1878, the same year that businessman John Britty North registered his coal mine at the base of the cliffs near the Orphan Rock. Within a year the high quality of his coal was winning prizes at the Sydney International Exhibition and the small settlement of Katoomba gained a reputation as an important mining centre. 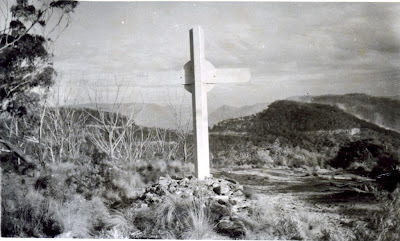 For many years one of the Blue Mountains’ most distinctive landmarks was a large white cross on the cliff-edge at Mount York which could be glimpsed from the highway between Little Hartley and Victoria Pass. Although now removed, the cross has been a continuing source of speculation and enquiry since its erection early in the 20th century. It stood facing west, just off the Mount York road, some distance before the obelisk which marks the western descent of the explorers, Blaxland, Wentworth and Lawson in 1813. The cross was formed of a large upright and transverse steel girder bolted together, and was erected about 1911 by Henry Marcus Clark (1859-1913) who founded the business known as Marcus Clark & Co. Ltd. From a modest start in the Sydney suburb of Newtown in 1883, Marcus Clark & Co rose to become one of the city's largest department stores with a network of branches in towns and suburbs across Australia. The improved line of road to bypass the steep tracks at Mt York was surveyed by Thomas Livingston Mitchell in 1830 and named by him Victoria Pass. In February 1832 there were nearly 400 convicts working on the Pass and its spectacular stone causeways. It was opened on 23rd October 1832 by Gov. Bourke. In 1836 Charles Darwin travelled to Bathurst and called it 'worthy of any line of road in England'. Except for a brief period between 1912 to 1920, when early automobiles preferred the easier grade of Berghofer's Pass, Victoria Pass has remained the principal route of access to the west.